During the weeks following the bombing of Pearl Harbor, the United States military anticipated difficulties transporting fuel and supplies to their bases in Alaska along the exposed west coast of North America. They undertook two massive inland projects to alleviate this problem, one was the construction of the Alaska Highway and the other was the CANOL Project. The CANOL (“Canadian Oil”) Project had considerable wartime impact on the Northwest Territories, Yukon, Alaska, northern Alberta and northern British Columbia. The purpose of the project was to send crude oil through a pipeline from Norman Wells (map) – at the time the most northerly producing oil field in North America – to a refinery at Whitehorse, Yukon. Petroleum products would then be sent from Whitehorse through pipelines to the Alaskan communities of Skagway and Fairbanks and to Watson Lake in the Yukon. The project involved the construction of 3985 kilometres of winter and summer roads, 2512 kilometres of pipeline, tank farms, airfields, and an oil refinery. 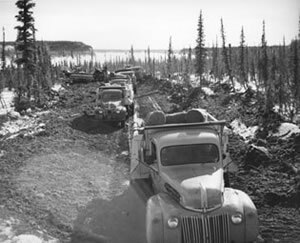 It was June of 1942 when this massive project got underway and twenty months later the “Golden Weld” was made in Macmillan Pass, on the Northwest Territories-Yukon border, to complete the pipeline. CANOL was an extraordinary construction effort costing hundreds of millions of dollars and at the time “was one of the largest projects of its kind and was certainly unrivalled in the north.” It employed, in total, 30,000 men, mostly American civilians working for the California-based construction company Bechtel-Price-Callahan (B-P-C). The pipeline traversed mountain valleys and high passes that prior to 1942 had been the sole domain of the Mountain Dene. It was these Dene who acted as guides and assisted the American military in laying out the route for the pipeline and road along one of their traditional trails connecting the Mackenzie valley with the Yukon. On March 8th 1945 the U.S. Army issued an order terminating the project. The pipeline had only been in operation for fewer than 11 months. Much of the pipe and some of the associated buildings and equipment was salvaged but what remained – an overgrown road and scattered evidence of what was considered to be the largest construction project since the building of the Panama Canal – was designated a Heritage Trail in 1996.